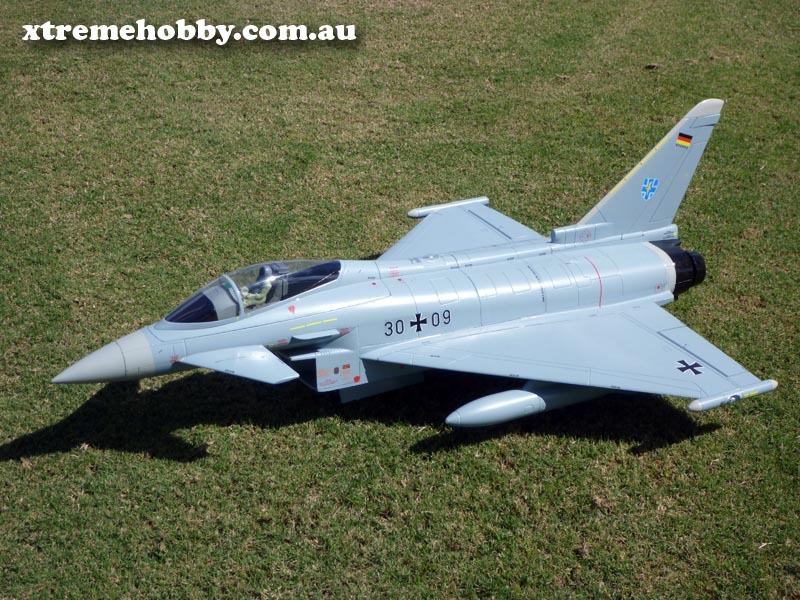 FREEWING XTREME Eurofighter 90mm EDF Jet - With Thrust Vector. Wing Area: 630 sq. in. Just add your own 6S battery (or 2 x 3S) 3700mAh +. Nothing looks more superior in the air then today's modern fighters, Freewing have outdone themselves with their newly released Euro Fighter Typhoon. Everything you expect from Freewing and more is what you get in the PNP Package. Just add Battery and Radio Gear and your ready to fly, everything is included. From operational Canards, Metal Retracts, Front Gear Door, Twin Thrust Vector Nozzles and a 7 Light L.E.D Navigation set, this Euro fighter will bring you a joy in flying like never before. It's perfect for a daily EDF Jet flyer, but turn on the Thrust Vector and Spool up the throttle on the included 90mm EDF Jet Fan and this bird will take your flying to a whole new level of excitement. Capable of the most demanding 3D Manoeuvres the Euro fighter is here to stay!. Grass takeoff's are no challenge and perfect high alpha landings allow for easy touchdowns at a safe and controlled decent rate. The cockpit is fully featured as seen in the pictures/video below and it even includes a scale Euro Pilot. To be honest I don't know what else to say, other than!, THIS JET HAS IT ALL, THIS JET IS A MUST, the perfect partner for any avid EDF Jet Pilot. Review : Love this jet. Flies very well, retracts are nice and sturdy and looks fantastic in flight. Only complaints are that it suffers hangar rash really easy ie delicate foam. However in saying this the foam used for the construction makes for great detail. Stock setup with 6 cell 4.5ah nano tech a spec battery. Overall I love flying this jet! Hi John Great to hear from you again, this current version now has Worm Driven retracts, built onto a 3 ply wood base, they are very strong to say the least!. I could do postage including registration and insurance for you for $28.00 , usually $47.00.